all embedded into a mostly useless macOS container app that magically installs an extension (sometimes) into the browser when first run. the container app (with its extension embedded) is distributed on the Mac App Store, as opposed to the old Safari Extension Gallery. the containing app can also be signed using a developer certificate and distributed outside the App Store like any other Mac app, and the extension will still operate – though I wonder if this will change in the future. Leaving aside my personal opinion about this weird hybrid extension model and its effects on the already dwindling Safari extension ecosystem, this document constitutes my notes on porting a traditional JS-based Safari Extension to a Safari App Extension. Disclaimer: This note pertains to Safari 12 and Xcode 10.1 only. Future versions may drastically change the extension model, and I may or may not update this document as things change. Corrections and constructive suggestions welcome in the comments. In the good old days, you went into Safari’s Develop menu and hit Show Extension Builder. In the brave new world of Safari App Extensions, extensions are made in Xcode, Apple’s all-purpose IDE. 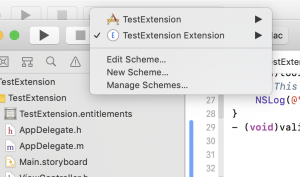 In Xcode 10.0, making an app extension was a really confusing process. You had to create a generic Cocoa macOS app, then File -> New -> Target and pick Safari Extension from the list of app extension targets. In Xcode 10.1 Apple has made it slightly less troublesome. 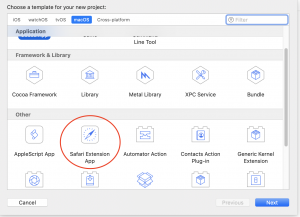 In New Project, you can select “Safari Extension App” directly as one of the project templates. The containing app — the containing app doesn’t have much functionality unless you are also making a macOS app alongside it. It effectively is just a delivery vehicle for the extension — when the app is first run, the extension is placed in Safari’s list of extensions, for the user to activate. The extension — this target contains most of the actual code that will run in Safari’s context. The templates for the containing app are largely irrelevant for stand-alone Safari Extensions. For me, I am building Safari extensions that stand on their own. 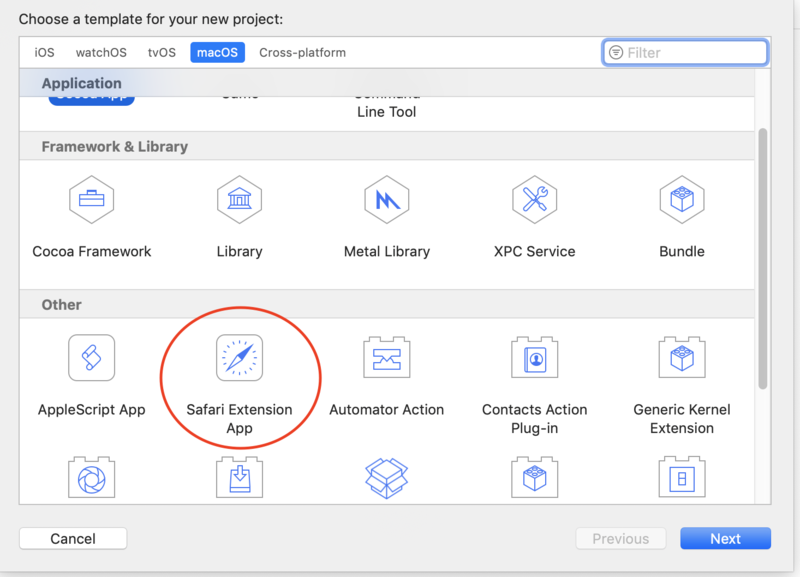 If you are building an app that happens to offer a Safari extension as a side effect, that purpose is out of scope for this document, but you may find something useful in here for building the extension itself. The meat of a Safari App Extension lives in the extension target. I am using an Objective-C project in these examples, but the Swift project looks very similar. SafariExtensionHandler — this class is the delegate that gets called by Safari to do things. The main functionality of your extension are invoked from here. In porting old extensions, what used to live in global.js now needs to be in this file. Obviously, such code need to be ported from Javscript into Objective-C or Swift. This SafariExtensionHandler object gets created and destroyed frequently during Safari’s lifetime, so don’t expect to put global initializers here without wrapping them in dispatch_once or making a custom singleton class. 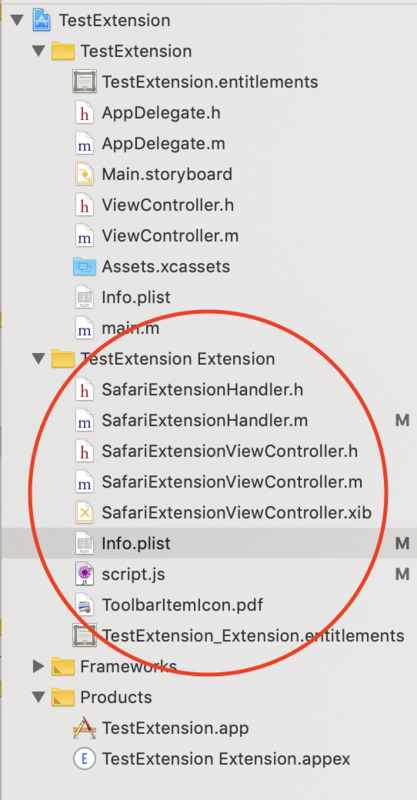 SafariExtensionViewController — this class is perhaps more appropriately called SafariExtensionToolbarPopoverController. 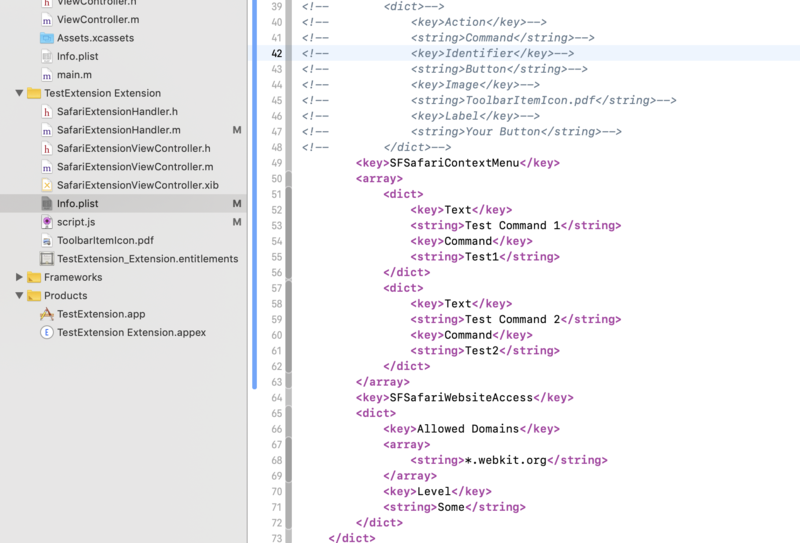 This is the ViewController class that is invoked if your extension’s toolbar button (singular — you are only allowed 1 toolbar button, ever) is clicked. As of Safari 12, this class only used to show a popover from the toolbar button. 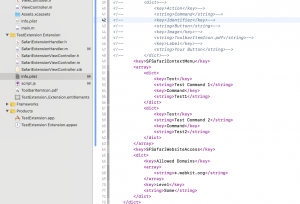 The template code creates a singleton class for this controller. SafariExtensionViewController.xib — the Interface Builder file for the toolbar popover. If you’ve done any Cocoa or iOS programming at all, this is effectively the same thing as any nib file. In short, you can lay out your user interface for the toolbar popover in this xib file, and load it during runtime (as opposed to having to programmatically create each UI element). Info.plist — This file should be familiar to anyone who made legacy Safari extensions. It is an Apple plist file (obviously) that largely contains the same kind of extension metadata, like what domains the extension is allowed to access, what content script should be injected. The template project’s Info.plist does not contain all the possible keys, like SFSafariStylesheet (injected stylesheet) or SFSafariContextMenu (context menus), etc. 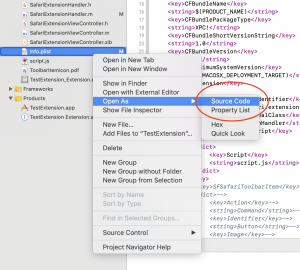 There is also no convenient list of all possible keys, though you can eventually find all of them by reading through Apple’s documentation on Safari App Extension property list keys. ToolbarItemIcon.pdf — the name is self explanatory. This is the icon that shows up in the toolbar if you have a toolbar item. .entitlements – Safari App Extensions need to be sandboxed. 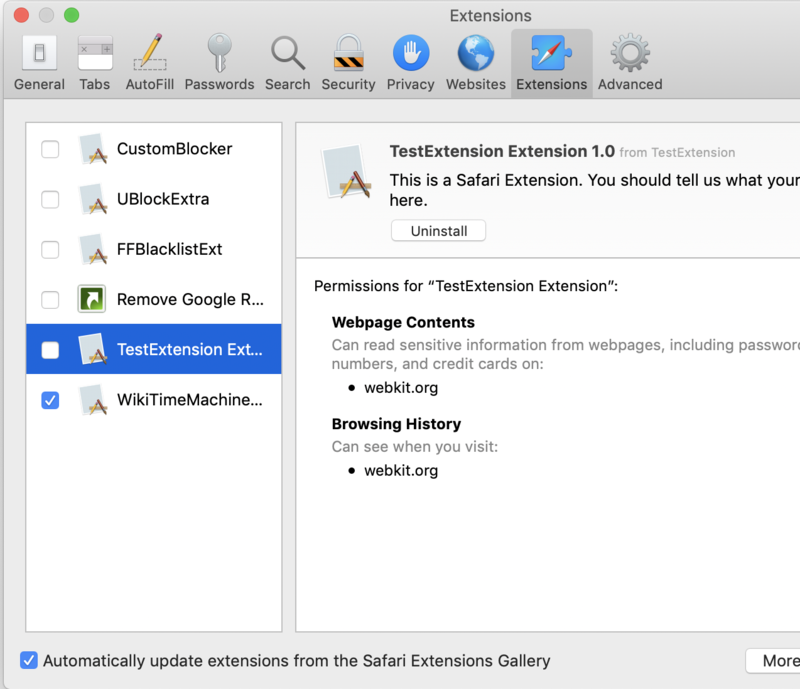 If you try to turn off the sandbox, the extension will no longer appear in Safari. The entitlements file allows you to grant specific sandbox permissions for the extension. I haven’t played with this much, but I assume this works like any other sandboxed app. It also allows you to specify an App Group. 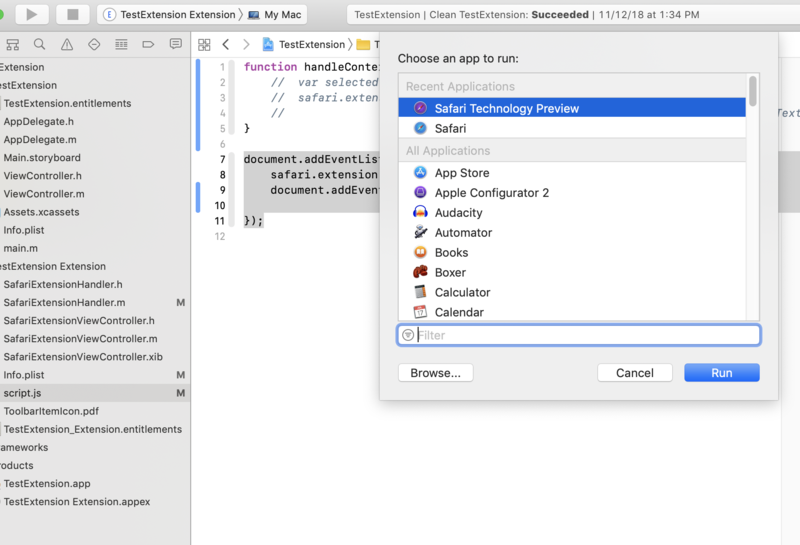 This is also a relatively advanced macOS / iOS dev topic that is out of scope for this document, but in short, if you put your extension and the containing app in the same App Group, they can share UserDefaults preferences and other system-provided storage space. Otherwise, the containing app and the extension will maintain their own separate preference and storage space. When you click “Run” in the Xcode project for an Safari Extension app, it builds both the extension and the containing app, and then runs the containing app. This should install the extension into Safari, but by default the extension is disabled until the user manually activates it. 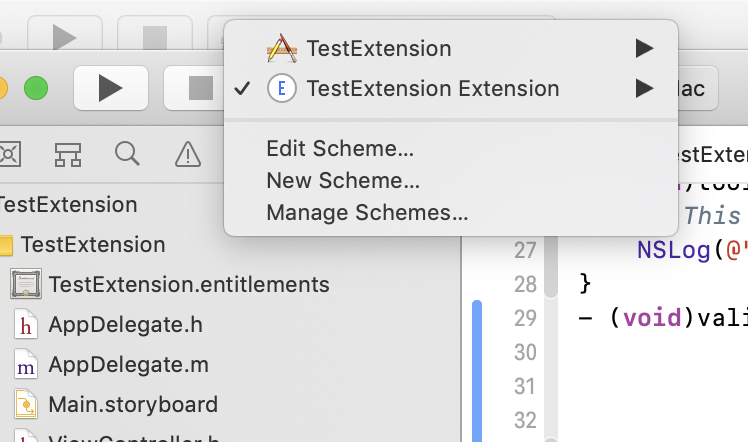 During development, you can instead run the App Extension target itself, by switching the scheme from the XCode toolbar. If you run the App Extension itself, a menu pops up asking for which browser to run it with (which can be Safari Technology Preview as well). It will then temporarily install the extension for the duration of the debug session. 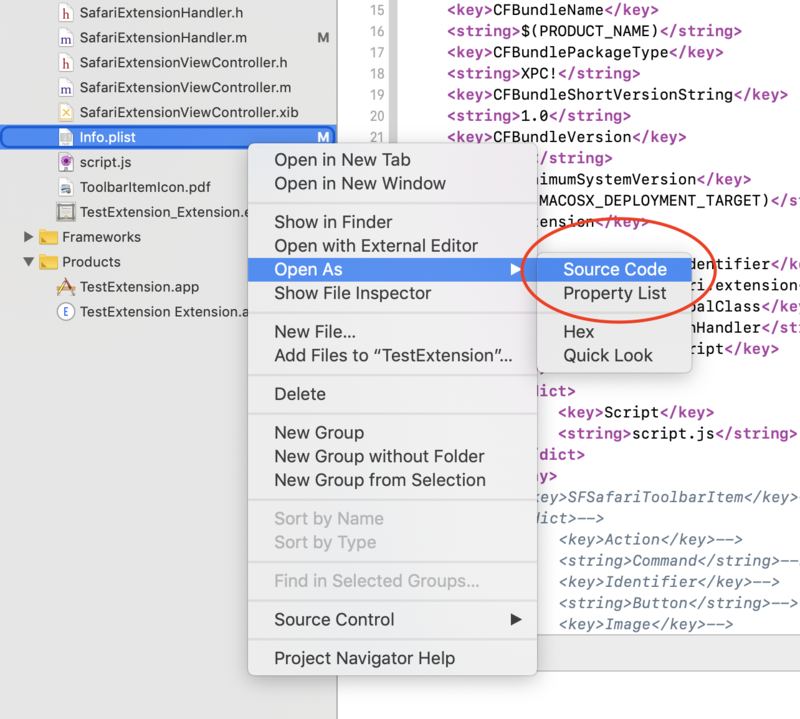 If run this way, you can also see any NSLog debugging print statements in XCode’s console, as well as use the built-in debugger to step through native code. Safari App Extensions have a similar architecture. However, it has torn out the global.js/global.html portion of this, and replaced it with native code implemented in SafariExtensionHandler. // This method will be called when a content script provided by your extension calls safari.extension.dispatchMessage("message"). Listen to messages from the extension using safari.self.addEventListener, same as before. For a trivial example, this approach seems to work — though I have not tested it extensively. I imagine for complex use cases though, the time spent re-building global.js to work inside a WKWebview is about the same (or more) than just rewriting it in Objective-C or Swift. By using Open As -> Source Code, you can edit the XML directly if messing around with plist editor is not your thing. However, plists are a specific format, with arrays and dict representations that are annoying to write raw XML with, if not using a plist-aware editor. Context menus have only changed a little from the legacy Safari extension architecture. You still specify context menus in the Info.plist, and they still interact largely the same way as in legacy extensions. As of this post’s date, Apple’s porting guide states that “In a Safari App extension, there’s no validation of contextual menu items before the menu is displayed.” This is actually wrong. The API does provide for validation of contextual menu items before the menu is displayed. In SafariExtensionHandler, implementing the validateContextMenuItemWithCommand method will let the extension decide whether to show or hide a context menu item, and whether to change its menu text depending on conditions. As it suggests, validationHandler returns NO for shouldHide if the menu item should be displayed, or YES if it should be hidden. The text parameter allows for the menu text to be changed dynamically during validation. What if we need to change which menu to show depending on if something exists on the web page or not? In the injected content script, listening to the “contextmenu” event and implementing a handler will allow you to populate userInfo dictionary with data, and validateContextMenuItemWithCommand will be called with that data. The code is again very similar to how validation is done. Safari App Extensions appear to be limited to a single toolbar button. Safari App Extensions cannot provide full toolbars (called “extension bars”, previously), like legacy extensions could. The toolbar button can be configured to trigger one of two actions: Command which invokes a command immediately, or Popover which creates the popover view as provided by SafariExtensionViewController. The “menu” action that legacy Safari Extensions had, which simply created a menu of commands to choose from, has been removed. See the guide on Toolbar Item Keys. To respond to a toolbar button click, implement - (void)toolbarItemClickedInWindow:(SFSafariWindow *)window in SafariExtensionHandler. To show a popover on click, implement - (SFSafariExtensionViewController *)popoverViewController. This should be part of the boilerplate code generated by XCode. Popovers are no longer HTML pages. They are now native AppKit views, created the same way as any macOS app’s views; legacy popovers would have to be ported to native code, or hacked using a WebView. The UI controls available to the popover are native macOS controls (NSButton, NSTextField, etc. ), and must be created and styled using Interface Builder (or programmatically). 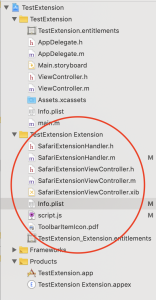 These UI elements can be wired up to the SafariExtensionViewController singleton, which can provide the delegate methods to respond as the controls are changed. 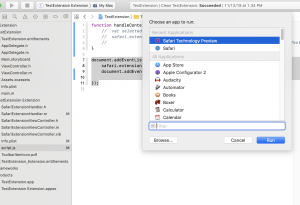 Converting a Legacy Safari Extension to a Safari App Extension — As of the time of this post, there is a heading in this brief Apple document called “Convert Legacy Safari Extensions Automatically”. You might imagine that this implies there is some kind of tool that automatically converts legacy extensions into app extensions, but this is not the case. 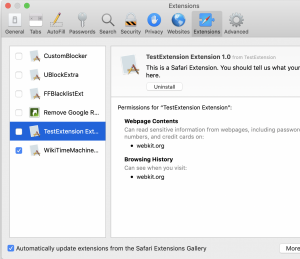 That section actually describes how you can uninstall a previous legacy Safari extension in favor of an updated app extension (that you still have to write, yourself, manually). So the “two options” that they mention is actually just one option, with a preface of how to remove a previous version of the extension written in legacy/JS form. I used these straightforward strongswan IKEv2 VPN setup instructions to set up a IKEv2 VPN on my Ubuntu server. However, instead of self-generating my own certificate authority and having to deal with manually trusting this untrusted CA on every device I have to use VPN on, I decided that since I had letsencrypt in standalone mode set up on my server already (and the vpn subdomain properly covered under the certificate), I might as well use that certificate instead. I’m sure I’m committing half a dozen security sins, but it saves me time that I used to spend googling “how to trust certificate authority on [device name]”. Setting up letsencrypt certificates with strongswan-based VPN is out of scope for this post, but in short, the difference is minimal. Instead of using the fake CA’s .pem, just symlink the letsencrypt certificate and key to /etc/ipsec.d/certs and /etc/ipsec.d/private. Remember to add a post_hook to /etc/letsencrypt/renewal/ to reboot strongswan after certificate renewal. This worked great on macOS High Sierra and iOS 11. However, Windows 10 (Fall Creators) refused to connect to the VPN, stating that “IKE authentication credentials are unacceptable”. The top google results for this were highly misleading for this particular context. It’s not about subjectAltName or Server Authentication flags or whatever. It turns out that unlike macOS or iOS, Windows 10 wasn’t processing the full set of root and intermediate CA certificates, even though I symlinked the fullchain.pem to /etc/ipsec.d/certs. After throwing a symlink from /etc/letsencrypt/live/[domain]/chain.pem to /etc/ipsec.d/cacerts, Windows finally relented and let me connect to the VPN. YMMV, because judging by the Google results, there are a lot of sources of error that yield the exact same, mildly useless “IKE authentication credentials are unacceptable” error message. However, this particular error is non-obvious, and worth looking at if you’re running into the same issue. If you’ve just upgraded to macOS 10.13 High Sierra from 10.12 and are wondering why Safari Technology Preview is crossed out with a white 🚫 prohibited/cross mark and unable to be launched, turns out there is a separate Safari Tech Preview version for High Sierra. Confusingly, the App Store / updater does not automatically upgrade to this version when you install High Sierra, so the old version left over in /Applications is just…sitting there, broken. Go back to the Apple Developer downloads page for Safari, grab the “Safari Technology Preview for macOS High Sierra” installer, and install it over the existing Safari Technology Preview. The app should then launch. If you recently had your Macbook Pro (Touch Bar) repaired (possibly with a logic board replacement), and restored from Time Machine backup, you might find yourself unable to use Apple Pay on Mac OS 10.12.5. The system will report “Apple Pay is already configured on this disk for another Mac” and ask you to “Reset Apple Pay and Add Card”. If you try to do so by authorizing it using fingerprint or password, it will immediately drop you back to the original “Apple Pay is already configured on this disk for another Mac” prompt, going back into this cycle ad infinitum. The issue is that there is an Apple Pay cache at /private/var/db/applepay/ on the system that has been invalidated, but it seems to be unable to delete this cache properly. It will keep trying to refresh this cached data, and fail to do so. There is a workaround for this. Obligatory warning: THIS IS MESSING WITH SYSTEM FILES. DO NOT EXECUTE ANY OF THIS IF YOU ARE NOT SURE WHAT YOU ARE DOING AND DO NOT HAVE A BACKUP OF YOUR DATA. TYPING THE COMMANDS WRONG MAY CAUSE SERIOUS ISSUES WITH YOUR MAC. I used this process myself to good success under 10.12.5, on my Macbook Pro. YMMV if you decide to try this on any other version of Mac OS. – On this second try, it will say “Apple Pay is already configured on this disk for another Mac”. – When you hit “Reset Apple Pay and Add Card” for the final time, it will actually break past the loop, and you will get to re-enter your Apple Pay card information without further issue. It’s a relatively easy fix, so I imagine the next OS version will have addressed this problem in a more elegant way. If you’ve just installed Mac OS Sierra and now see photoanalysisd sucking 100% to 200% CPU power, this process is doing some kind of face detection + object / image recognition / indexing on your Photos library. Open Photos.app, select People on the left sidebar, and see how far it’s gotten in this task. If you have a very large Photos library, this might take a while. As a bonus, while Photos.app is open, photoanalysisd is suspended, allowing your laptop fans a bit of a rest. It’s all for a good cause. After indexing, you’d be able to type “ocean” in the search box and get all your photos with the ocean in it, without having to tediously tag all your photos yourself. Magical, huh? ( Not really. If this is doing what I think it’s doing, well, it’s the kind of problem computer vision researchers have been tackling – and solving – for years already.). As an aside, for consumer-grade apps like Photos, arguments have been made to do computationally intensive image analysis in The Cloud(tm) instead of on client machines. The tradeoff is fairly obvious. In exchange for the privacy benefit of Apple not uploading color histograms of all your photos to its own cloud servers (something I’m sure Google wouldn’t bat an eyelash at doing), you’ll have to pay the cost of doing this analysis yourself, with your own measly consumer/mobile-grade CPUs (which isn’t ideal if you want to get work done at the same time that this analysis is going on). Overall, the user experience probably could have been handled better, especially given the extensive public beta period that Sierra received. The current opaque process violates some core UX principles: giving users (at least the feeling of) control, and giving the user clear reasons to trust in the importance of the task being performed. Apple should have known that eating 100% CPU while people are actively working with their machines is immediately noticeable, and should have 1) let the user know that image analysis is about to happen, and 2) given them the option of choosing when and how much CPU to devote to this task. Microsoft now ships a real SSH server (and client!) with Windows Fall Creators Update, no Cygwin or Linux subsystem required. Finally. This post remains for historical context only. Microsoft has finally landed its anniversary update for Windows 10. Among all the random useless features, is an actual Ubuntu Linux subsystem within Windows, with the ridiculously silly name “Bash on Ubuntu on Windows”. Goodbye Cygwin? One of the first things I wanted to try was to setup the SSH server, so I can remote-login from my real box. Getting one up was actually fairly easy, if you can deal with a few problems with weird, weird red-herring error messages. There is no SSH server on port 22. There are multiple underlying problems here. First, it’s important to note that there exists a separate Windows SSH server (separate from the OpenSSH server from the Ubuntu subsystem installation) now on port 22. If you telnet (yes, telnet) into port 22, and the host greeting is SSH-2.0-MS_1.100, you’ve run into the Microsoft SSH implementation (hence the MS part in the greeting). I’m not sure what this server is supposed to do (and, in fact, starting SSH servers on standard ports without explicitly telling the user seems like a potential security problem to me, in addition to being kind of jerk-ish). I do know it is launched when you reboot with Developer Mode on. You know, Developer Mode, the mode you have to turn on to run Bash on Ubuntu on Windows. This server is occupying port 22, so you cannot launch another SSH server to listen on this port. This is the problem that is causing the silent failure of sshd to start up, not a broken Upstart or any of that nonsense the error message being displayed is referring to. Apparently the Ubuntu compatibility layer on Windows does not implement chroot or one of the related system calls needed for OpenSSH privilege separation at the time of this post. If you launched bash from DOS cmd.exe, instead of the Bash on Ubuntu on Windows shortcut, /mnt/c/Users/[Windows Username] (the directory you start with in DOS) is not your Linux home directory. .ssh config files left in this directory will not configure your OpenSSH server. To resolve the problem of conflicting SSH servers, set your OpenSSH server on a different port : one other than 22. This can be done by editing /etc/ssh/sshd_config and changing the Port configuration. Be sure to open this new port in your Windows Firewall for inbound connections, as this firewall configuration will not be automatically done for you. I set mine to 60022. To enable public key auth and set other configurations, the Linux subsystem home directory is, as in normal Ubuntu, /home/<yourname>. If you’re looking to re-download Microsoft Windows 10 Education edition ISOs and have a valid key from the university licensing program already, grab the education edition ISO images directly from Microsoft instead of paying OnTheHub/Kivuto protection money. UC Berkeley, like many other universities, has a volume licensing deal with Microsoft for its operating system products. In particular, it offers free downloads of Windows 10 Education edition to all current students. The irritating thing about this is that they offer this deal through a shady vendor called OnTheHub or Kivuto. Instead of allowing the ability to re-download the ISO image, it holds you hostage if you want to access the image file again after 60 days. To ensure that your download and/or key(s) remain accessible to you, you can extend your coverage to 24 months with the Extended Access Guarantee for $4.95. With this service, Kivuto will back up your download and/or key(s) on their servers, allowing you to access this information at any time under the “Your Account” section of the WebStore. Purchase this service if you wish to recover your download(s) and/or key(s) after access has expired. In my case, I backed up the wrong ISO — the generic install ISO, instead of the education edition ISO. The product key Kivuto issues you is for the Education edition, so the generic ISO you can get online won’t let you install with the key. It’ll report an error of “The product key entered does not match any of the Windows images” at install time. So when it came time to reinstall, suddenly I’m faced with the OnTheHub protection racket. For Windows 10, at least, you don’t have to pay the protection money. Education edition ISOs are available directly from Microsoft after product key verification. The download page is rather well-hidden, under the “more options” link from the software download page. Unsurprisingly, OnTheHub makes no mention of this download source. I wonder how much money OnTheHub makes off people who didn’t realize there was a free, official source for Windows 10 ISO images. Bandwidth costs money, sure, but you are a *education software download vendor* in 2015, with a target market of underpaid students and faculty. Nickel-and-diming poor student users for software downloads, in this era of cloud-driven computing, is an obsolete and despicable business practice. While working on a project on OS X 10.10.4 Yosemite, some innocuous Python 2.7.6 code using the multiprocessing module (via the concurrent.futures module) was crashing when run from the IPython interpreter, but works just fine when executed via shell directly. Some nice simple test code. It pulls some data from two Web servers, via the requests module, concurrently using a multi-process worker pool. The same code works just fine under Ubuntu Linux, from IPython or otherwise. It turns out that there is some kind of edge case bug going on between IPython, multiprocessing, and OS X. Namely, a segfault seems to trigger from within OS X’s Grand Central Dispatch architecture, when multiprocessing is forking a new process to access the network, under IPython. Something in _scproxy.so (a part of Python’s lib-dynload) is not happy with libdispatch. IPython 4.0.0-b1 -- An enhanced Interactive Python. works just fine. No segfault. Of course if you actually need this proxy functionality, you would be out of luck. The last beta of OS X has apparently removed the option to create POP3-type email accounts for Gmail in Mail.app. When you type in a Gmail account, IMAP is setup automatically. Presumably because OAuth doesn’t work all that well with it. There (currently) is a workaround. Turn off/unplug your Internet connection. This will force Mail to not verify the settings that you are giving it. In the email address field in the following box, enter something that IS NOT @gmail.com. Enter some random email. Use the application-specific password in the password field if you have two-factor auth setup. Hooray for we remaining holdouts, still using obsolete and dubiously secure technology. Because when I want mail on my local machine, I mean I want mail on my local machine, The Cloud(tm) be damned. Note they might still change this depending on feedback received. I would advise giving such feedback if you care at all. If Mail.app is stuck at “Fetching Mail….” with Gmail POP accounts after upgrading to OS X 10.10.3’s beta, be aware that Apple added OAuth support to Mail.app. Which is nice, except in the current beta, they don’t warn you to go set up OAuth permissions for every account. Mail.app will choke on fetching mail, without letting you know the actual problem. This is possibly POP3-specific, as I didn’t notice IMAP having this issue. The solution here is to simply set up Google OAuth via System Preferences -> Internet Accounts. It should automatically prompt you for OAuth permission to your Google Account when you click on the affected account in the prefpane. Once that is done, Mail.app will fetch Gmail via POP3 again. I’ve also unticked “automatically detect and maintain account settings” under Advanced, in Mail.app’s accounts panel, though this might just be superstition rather than actual prevention of issues. I’m just old school and uncomfortable with the thought of “automagic” happening in my mail server settings. I really need to rebuild Selfsolved. Someday, when I’m not trying to write.